Last picture of bench sadly gone to the tip. Beautifull Garden Dottydaisy, Why has your bench gone to the Tip? Hi, not only the bench but the table as well, they had become rotten, living near the sea does not help, was very sad to see them go, had them a very long time, still onwards and upwards!! good excuse to get some new furniture? Perfection.... well done. A credit to you. Really spectacular garden Dottydaisy. Give yourself a pat on the back. I can only dream of a garden this beautiful! Wow! Did you do this all by yourself, it's a credit to you. Wow.., your garden is amazing, and your lawn is to die for ! Thank you all for your lovely comments, Ladyessex1 no I dont do all this by myself I have a very good gardener (my husband) it is an equal partnership, though the lawn is his, I am not allowed to cut it! I just love your garden Dottydaisy2!!! Wow!!! What a lovely garden, Well done to you both. A truely beautiful garden Dotty. Congratulations. I had a relook at this pic again....S.O.L. (Sigh out loud) So lovely!! Thanks Panther you are very kind. Your garden is amazing! Everything looks just right and so well cared for. This garden should have an award!! Ideal Garden...Top marks. hi dotty, only new to this site and yours was the 1st photo i looked at and i have to say i can see alot of dedication and love has gone into your garden i'm hoping to achive this border of flowers myself this summer,since i have gone part-time in my job. Hi there Collette and welcome, glad you like this border, it is one of my favourite pictures, it has changed many times since this picture was taken, hoping for an even better one this year.......good luck with yours this summer, and dont forget to post some pics. 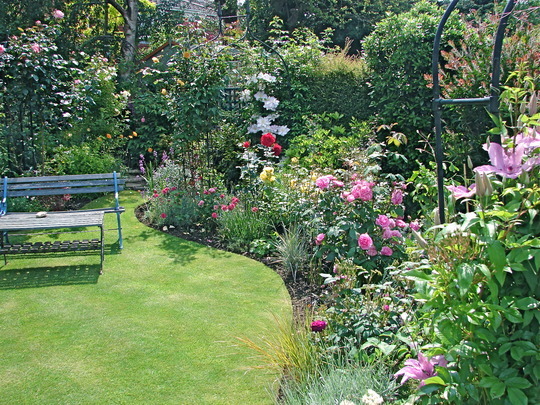 This garden is very nice so neat and tidy Dottydaisy do you spend a lot of time gardening as at my age my little bones ache, this is a lively garden thanks for sharing it with us. We both spend a great deal of time in the garden, but this last year my knees have decided they don't want to work any more !! so things are going to be a tad tricky next year!! Hi Dd I was looking for tips on border shapes on the forum and came across yours, It's absolutely beautiful I love it! Just my type. Scot that's very kind of you, the basic shape is still the same, just the planting has changed since this photo was taken.